This is what happens when the biggest film franchise of all times meets the safest children’s toy of all time. PC, Xbox 360, Xbox One, PS3, PS4, Wii U, Wii. The Silver Super has been attacked by Doctor Doom and his Legion of, well, Doom. His cosmic surfboard has been broken up into cosmic … bricks. To stop the scheme, the entire Marvel universe must come together and stop Doom. But he’s hired every villain in the entire Marvelverse to collect the bricks. Oh, yeah, did we mention that the Silver-Surfer’s boss, Galactus, eats planets, and is coming to Earth to see what’s holding up the Surfer? This is very simple while doing a lot of things at once. One button will switch from one character to another (thus far, Maximum has been 3 on the screen at once). The same button to switch characters can also allow you to change the character into different forms (Hulk to Bruce Banner, Spider-man to Peter Parker, etc), or, holding it down longer in free-to-play sections can lead to choosing from the expanded cast roster of over a hundred characters. The jump button does different things for different characters — be it double-jumping, flying, or web-slinging. The special abilities button can do something as simple as activate heightened senses (for Wolverine or Spider-Man), and holding it down arms and lets you target with a ranged weapon (Iron Man missiles or Captain America’s Shield … or Spider-man’s web shooters). It’s a Lego game. It was fun action with lots of little puzzles scattered along the way. The music surprised me. I think some of these musical pieces were from the films. Yes, the soundtrack was that good. Almost epic, really. If you don’t have the various and sundry soundtracks from the Marvel films, you might want to give this soundtrack a listen. And the graphics also surprised me. They were beautiful. Really. I’m trying to figure out how a Lego game made a realistic-looking New York … well, realistic for the most part. It was surprisingly well done. There’s just so much to see and do in this game, it’s genuinely easy to fall in. 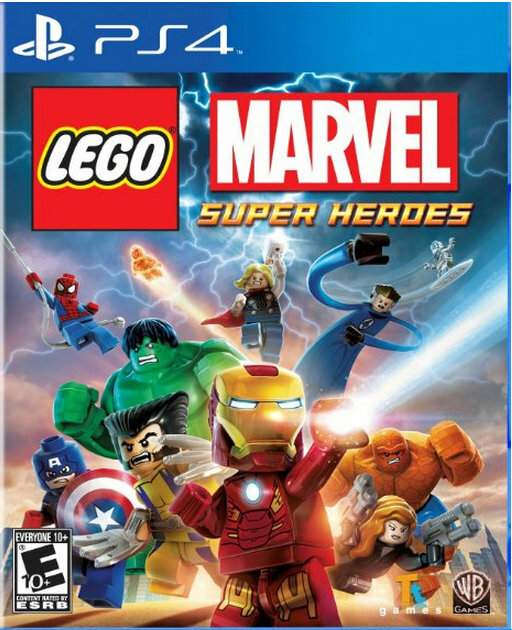 I love this game, but then, Lego rarely makes bad games. They’re safe and fun for kids, and relatively easy. You can’t even stay dead in the game. There’s no blood, gore, foul language, nothing even remotely unnerving. This entry was posted in Fiction, Gaming, Reviews, Superhero, Video Games and tagged Bruce Banner, Doctor Doom, Hulk, Lego, Lego Marvel Super Heroes, Marvel Comics. Bookmark the permalink. 3 Responses to Lego Marvel Superheroes. With all the improvements the Lego games have been making with each new release, I’m seriously hoping for a Lego RPG game. The character creator is pretty much already there; it just needs expanded options. The Marvel world has been the best designed so far, but the most recent DC game demonstrated that the developers can do multiple worlds/regions within the same game, too. Imagine exploring a Lego world with multiple themed regions, as in THE LEGO MOVIE. Despite, y’know, having a Lego house as my supervillain lair, I’ve never been a big fan of the Lego games. Part of that is not wanting to invest in console systems, but a lot of it has just been me not interested in virtual bricks. It’s the physical ones that feed the art form. However, a Lego MMO, with sufficient building techniques and customization, would be interesting enough for me to try it out. Most of the Lego stuff is designed by people who don’t seem to have much appreciation for the capabilities of Lego bricks, but something more like The LEGO Movie as a persistent world would be a pretty good start. One of the reasons I absolutely love that movie is precisely because the people who made it are genuine fans. They didn’t just build a world out of bricks and not do anything else, like the Lego Marvel animated shorts you can watch (where basically the same plot would happen if the world weren’t made out of bricks). The movie takes it to the logical conclusion, and then continues from there. It’s not strictly a console game, though. The graphics requirements are so low, it’s surprising. You could run it on your computer. I know I”m running it on mine.